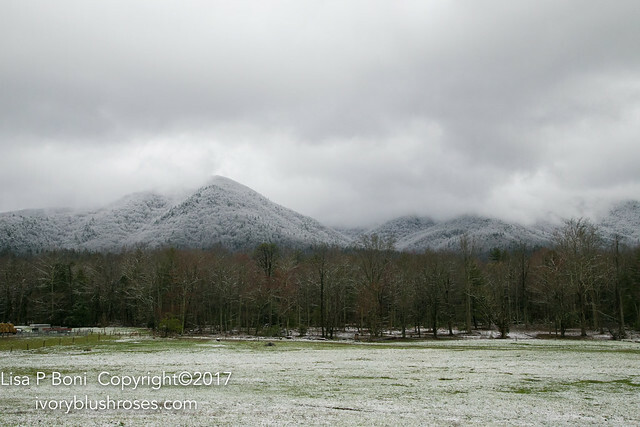 On my last day in the Great Smoky Mountains, I woke up to cold and snow! It prevented me from taking the high road over the top, so instead I spent another day in Cade's Cove. So different on this day and I found that my eye sought out different things. 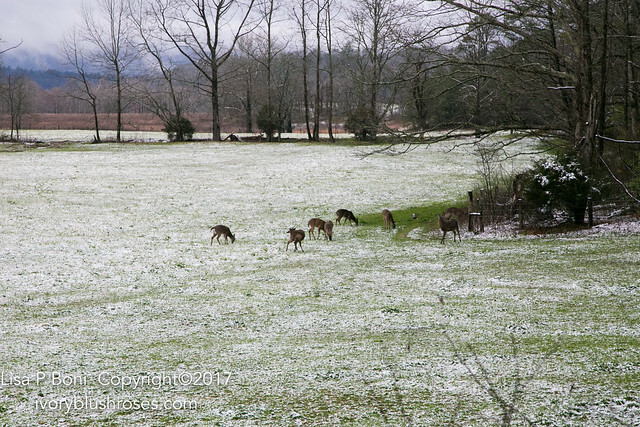 The herd of Whitetail Deer were much more subdued and focused on eating rather than on playing on this chilly morning. 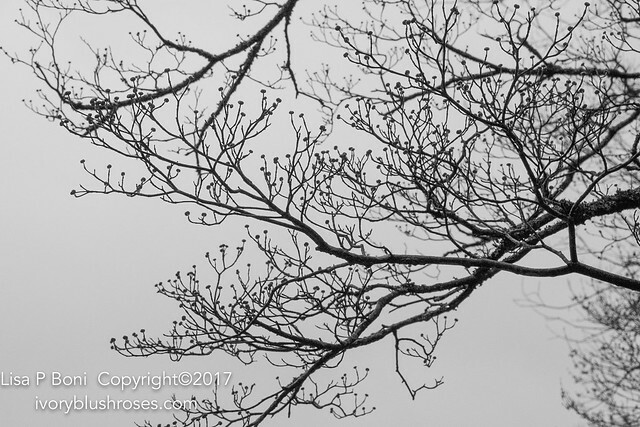 Details of the trees stood out against the grey skies. So lovely and graceful when silhouetted against a lighter sky. 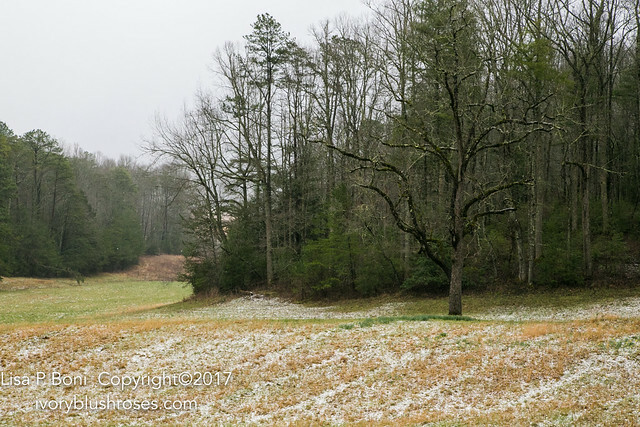 The snow brought out the greens and golds of the fields and meadows. 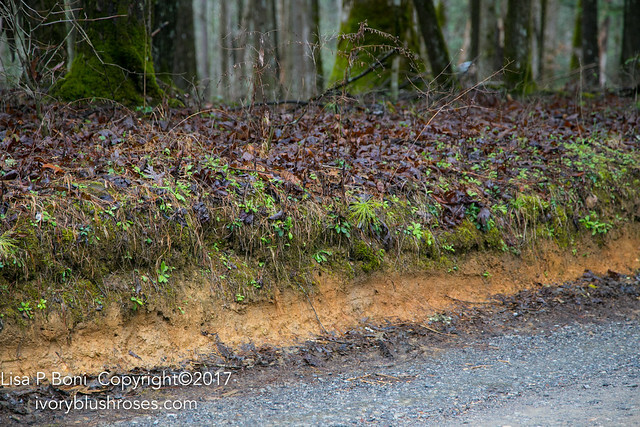 Along the roadsides, the orange of the deeper soils was much more apparent. 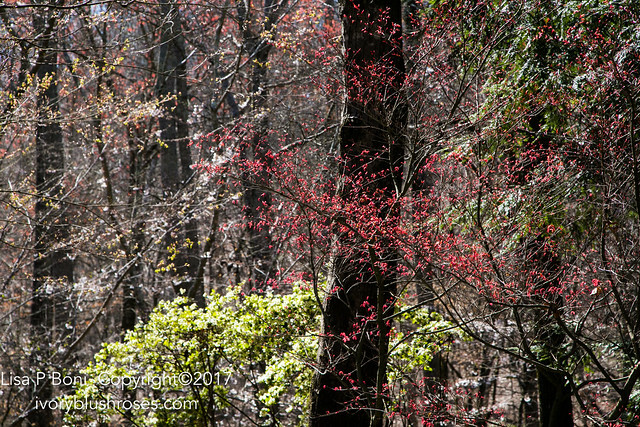 The light dry leaves of the dogwood stood out even more like blossoms in the dim light. Still beautiful, despite the snow and the cold. Throughout the day, the snow gradually melted away, returning now and again in slight showers. The added moisture brought the green of the new grass to life. 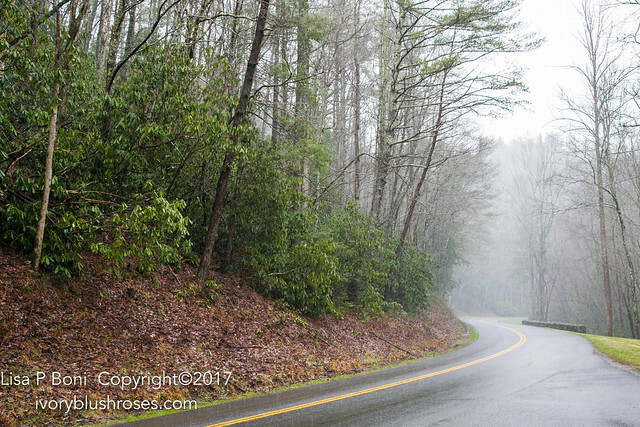 The grey mist through the trees made it easy to see why these mountains are named the Great Smoky Mountains. 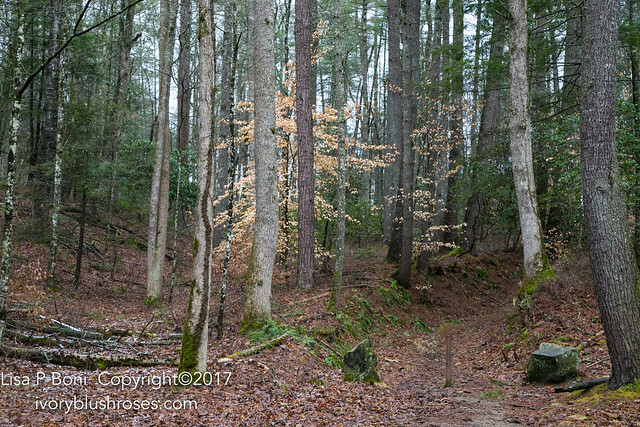 The forest floor's layer of red leaves was more apparent with the damp. 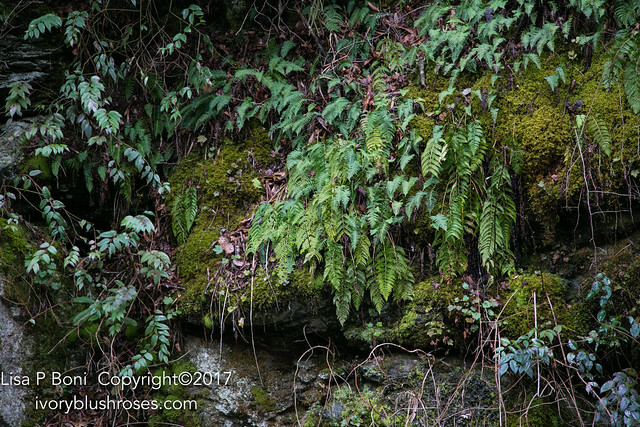 On the rocky faces, fern leaves that hung dry and limp the day before were now perking up and the green intensifying with every drop of moisture. The rock formations along the road are every bit as spectacular as those here in the west. 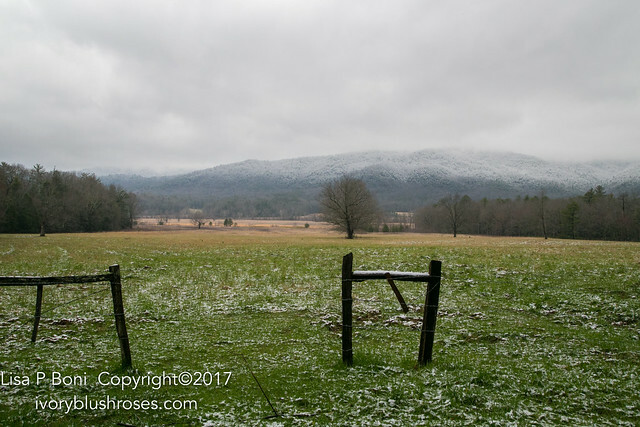 The mountains of the Smokies might be older and worn down with time, but they are mountains just the same! 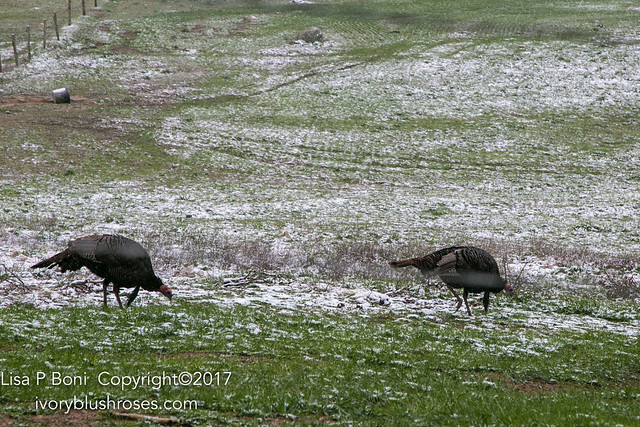 I saw two groups of wild turkeys, this one made up of Toms and the other made up of Hens. 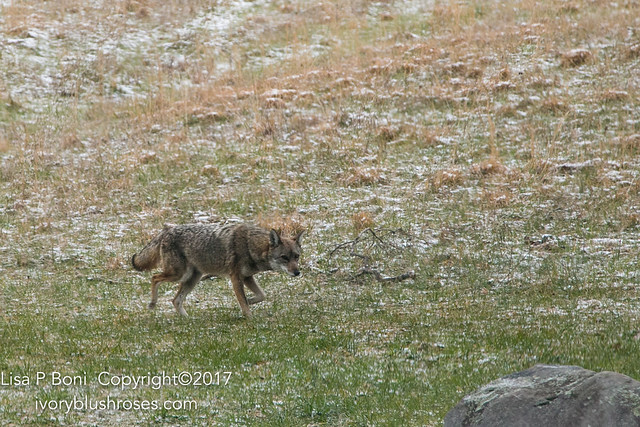 Seeing this coyote making his way across the field was a treat! But that look in his eyes tells me he wasn't as happy to see me as I was to see him! 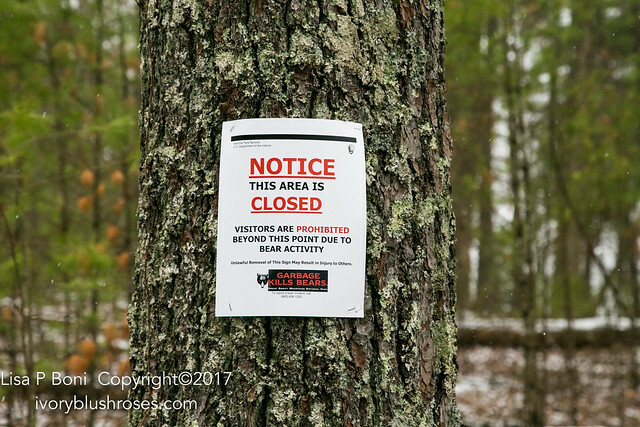 In one area, there was much yellow flagging and these signs alerting visitors to bear activity in the area. The ranger said that there was a huge tree fall in the winter den area and so a mother bear had woken from hibernation early and was active with her cubs in this area, so they closed it off to protect her and the cubs as well as the visitors. 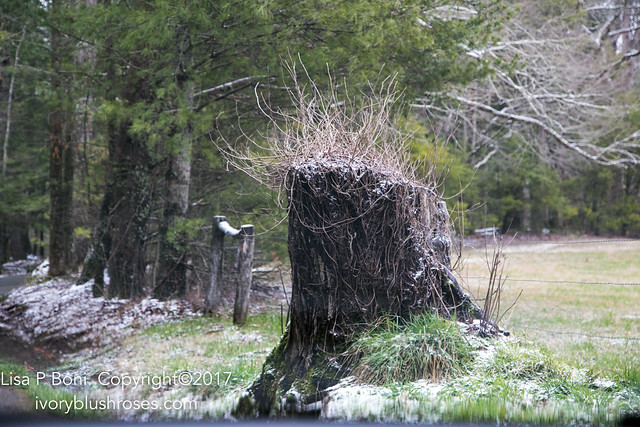 I must have driven past this stump a couple of times the day before and not "seen" it. But with the cold, suddenly its top of frizzy hair caught my attention and made me smile! 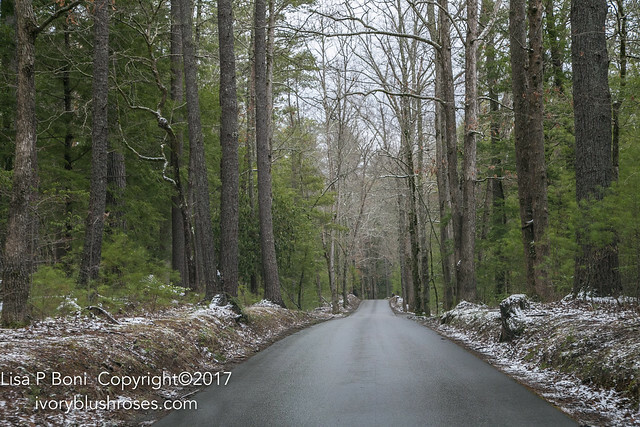 The woodland roads still beautiful in the light snow. 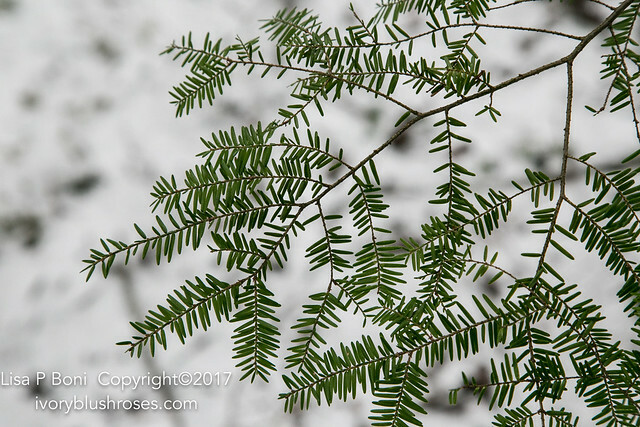 The soft delicate needles of the Eastern Hemlock. I really fell in love with these trees. Just beautiful! And they have the loveliest tiny cones on them! There were a lot of these pines as well. Southern White Pine, I believe, though I may be wrong. One of the things I miss when I'm not able to drive my car from home, is having to leave behind all my nature guides! Isn't this a magnificent tree? Here in Colorado, there are so few hardwood trees ~ on the plains it's mostly cottonwood and some willow. 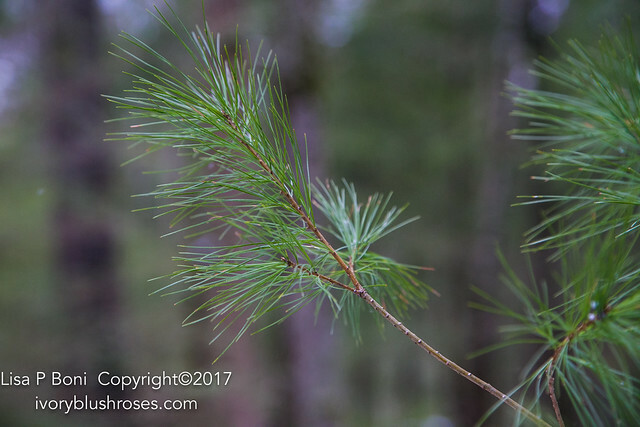 In the mountains it is Ponderosa Pine, Douglass Fir and Engelmann Spruce ~ all so different from the eastern woodlands. 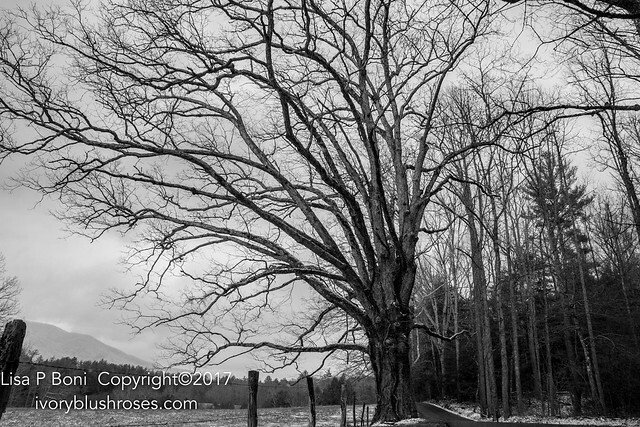 Getting to see these beautiful trees here in their native setting is such a gift! So beautiful! 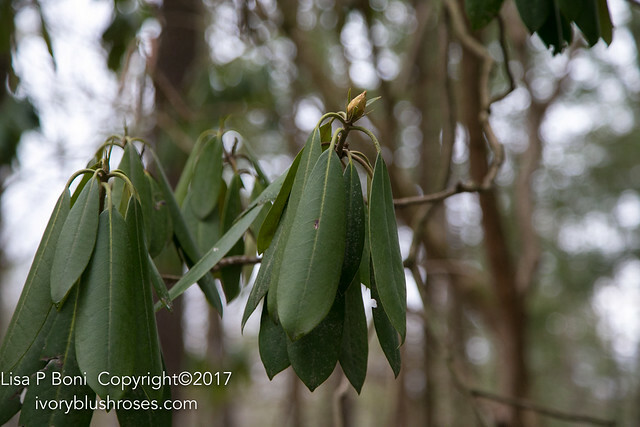 Today I could see the buds forming on the Rhododendrons. They should be spectacular in a month or two! My last photo as I left the park for the last time. 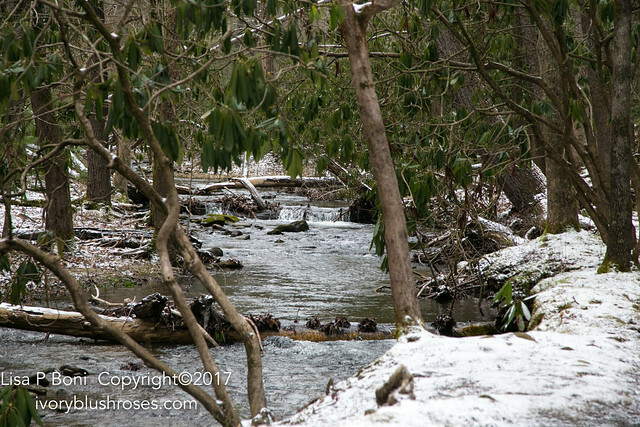 A lovely winter stream canopied in Rhododendron. The next morning I left Townsend before dark and made my way south back towards Atlanta and the airport. 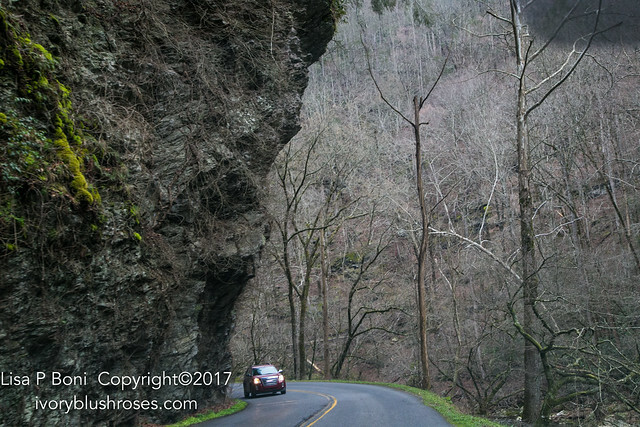 I had hoped to go back via the road over the Great Smoky Mountains, but it was still closed due to the snow. 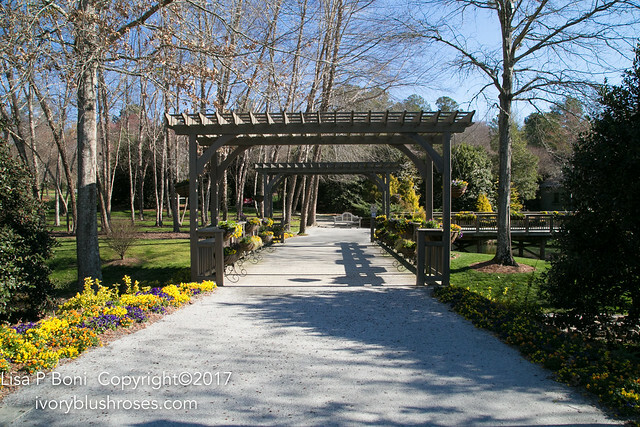 Instead I made my way across eastern Tennessee and into northern Georgia to Gibbs Gardens. 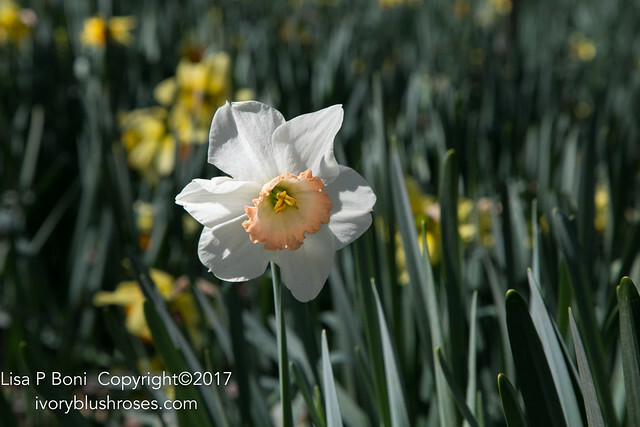 On my way north, I had seen signs on the highway advertising 2,000,000 daffodils! 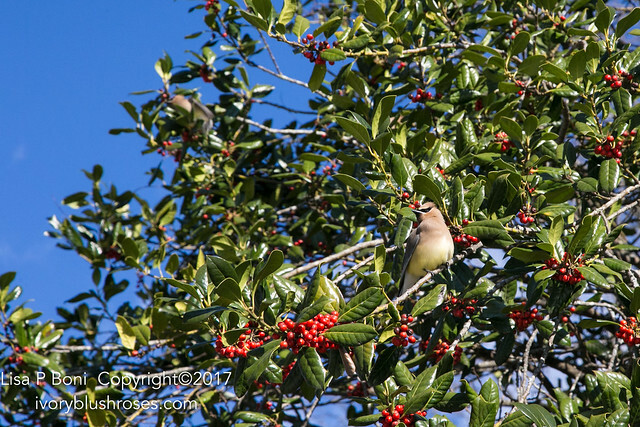 When I arrived, I was greeted by an enormous flock of Cedar Waxwings! They are only seen rarely in Colorado and I've never seen them so closely as I was able to see these! Gorgeous! 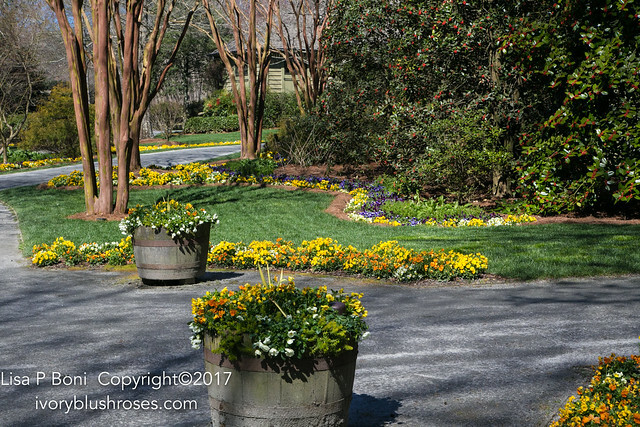 The entry was lovely, with huge underplanting of mostly yellow and some purple pansies. It was a super chilly morning, only about 28 degrees when I arrived! I was grateful for my winter jacket and gloves! 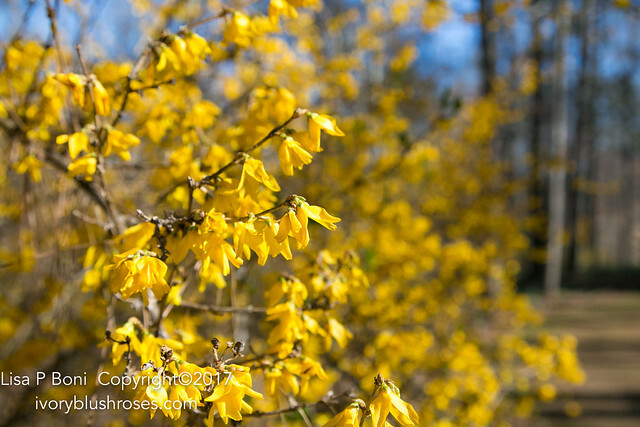 It didn't stop the forsythia from blooming though! 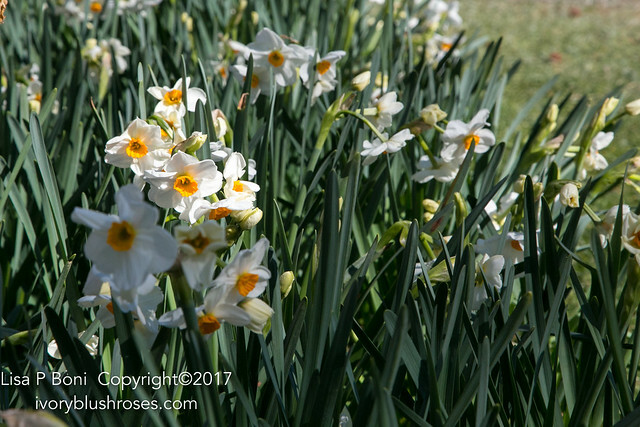 Normally at this time of year, this hillside would be filled with those millions of daffodil blossoms, but due to early unseasonably warm temperatures, the daffodils were nearly finished blooming. It was still a lovely walk down the hill on broad grassy paths through the woods. 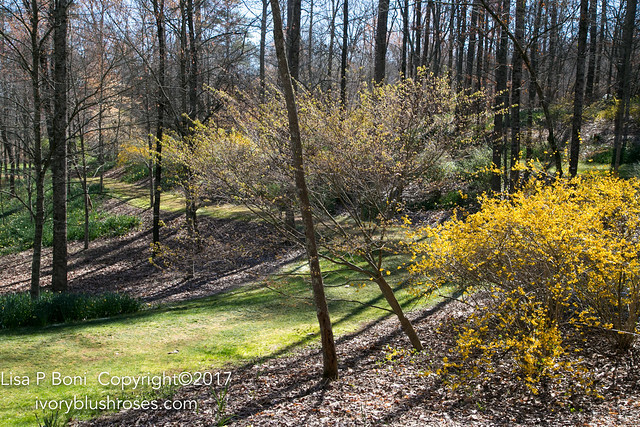 All around were blooming shrubs. 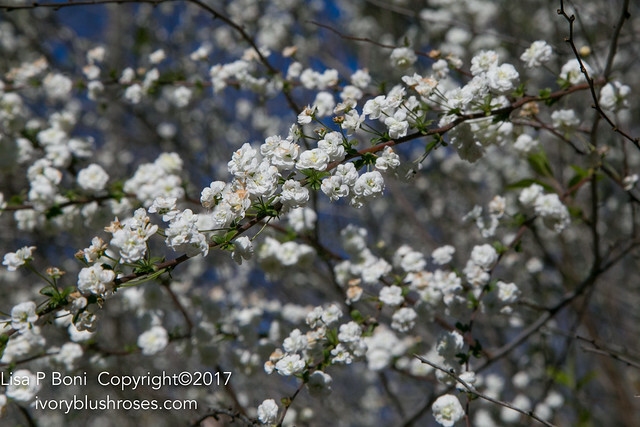 Pearly white spirea blooms. They sparkled in the landscape! 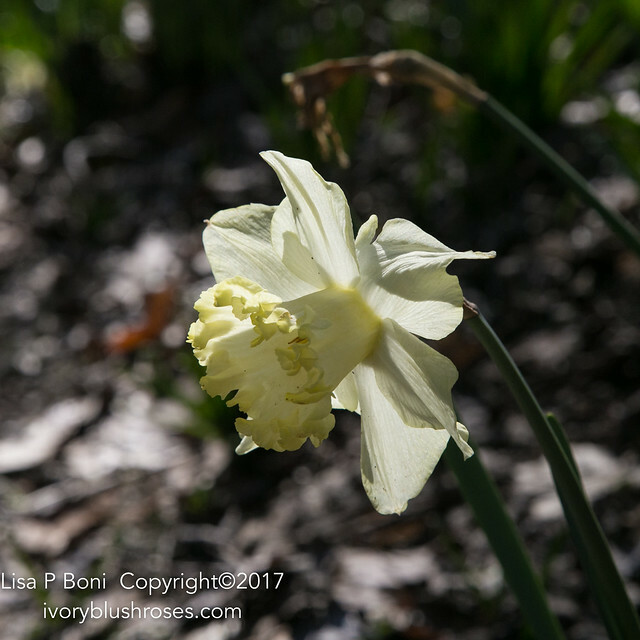 Though most of the daffodils were done, there were still plenty to see! I love these white ones with orange centers! And this one with a pinkish cup. My sister and I have both planted "pink" varieties throughout the years and been terribly disappointed. What fun to see that here they actually are rather pink and not just an ugly shade of dirty yellow as they usually turn out for us. At the bottom of the hill lies the full garden, complete with numerous ponds, many paths and loveliness everywhere one looked. I had the gardens virtually to myself due to the cold. But it warmed up enough to be a lovely walk. 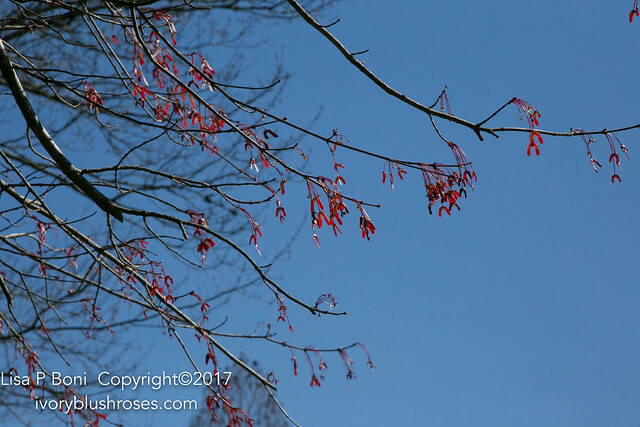 I was finally able to get a good photo of the magenta samaras on the trees! I found myself wondering if the color of the samara is an indication of the fall color of the leaves. 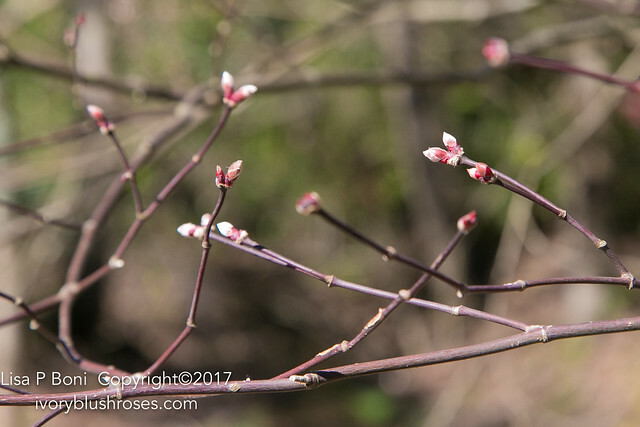 Everywhere were thick fat buds of leaves on the verge of bursting forth. Nearly as beautiful as flowers in my humble opinion! 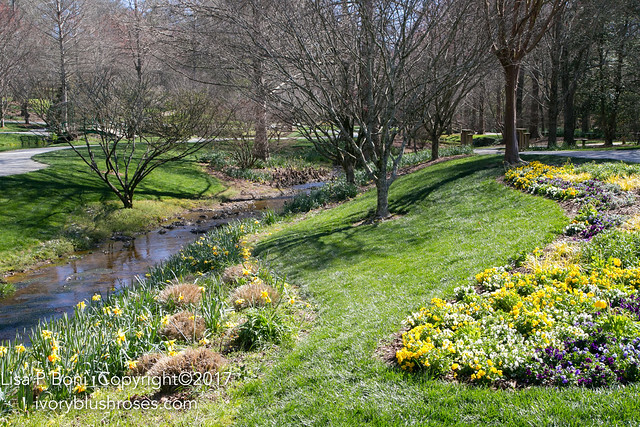 Along the streams were more plantings of daffodils and pansies. 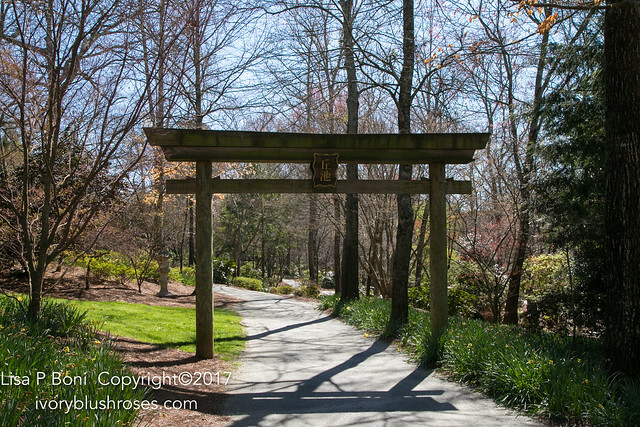 A tori gate at the entrance to the Japanese style garden. The colors in the woods here were magnificent! 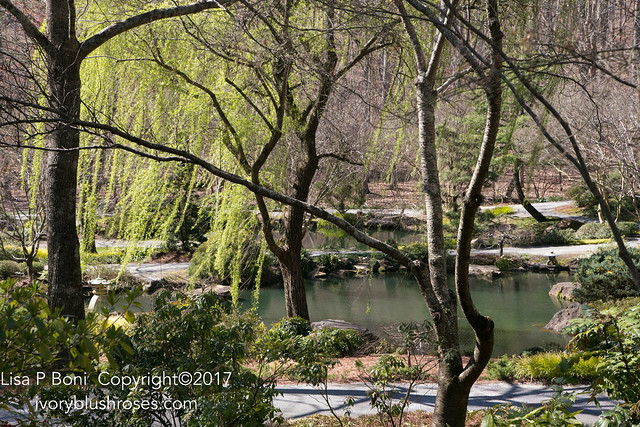 The weeping willows in the Japanese garden were already cloaked with green! So graceful above the ponds! 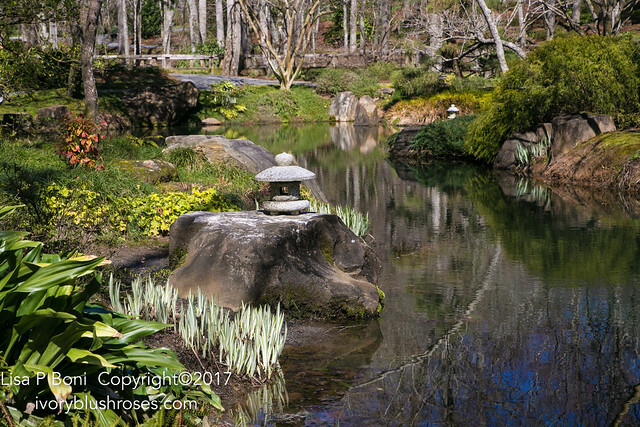 I loved the assortment of Japanese stone lanterns throughout the garden. Each pond had a different style. 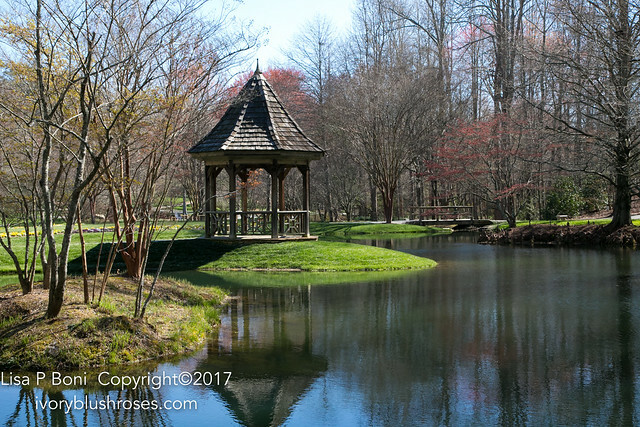 How glorious will this pond be once the iris' start to bloom? Just lovely! It was a perfect quiet morning spent in a beautiful setting, before spending the end of the day in a noisy airport and packed plane ride home to Colorado! It truly was a lovely trip. Far too short as usual! One of these days, I'll sell my little home with it's too big yard and head off with an RV to spend time exploring the lovely places in the country! How grand it will be to decide to stay in a place and watch the seasons change. It's what I dream of anyway! What a lovely trip you had! The photos are great in sunny and snowy days.